We have updated this form in line with GDPR legislationto make your life easier. Now you can make sure you capture all the information you need without mistakes with this easy to use telephone booking form. Covering all aspects of a booking, it can be referred to in support of a verbal contract and substantiate credit card deposits for "no-shows". With punched holes for easy filing it provides a continuity of information and all the details you need for every booking. Really good for prompting and helping to make a phone booking seem very professional and clear. 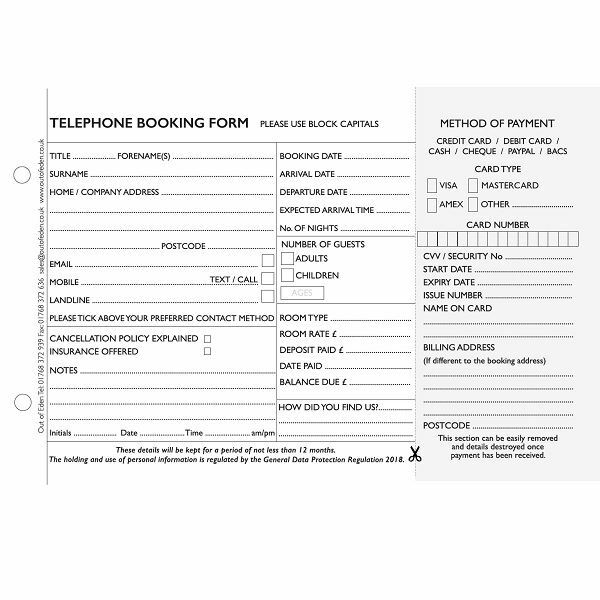 We have used these forms for 10 years now and find them ideal when taking telephone bookings as they contain all the information needed. Only criticism is that the email address section could be bigger. a great product, just what any guest house and B&B needs. Would be lost without them. These are a wonderful tool to use when accepting telephone bookings as it has boxes to ask all the right questions!Downside? Well I guess it is a little annoying that the forms/packs are joined at the top whereas the sheets have holes on the left to go into the 'made to measure' binder. It makes it almost impossible to tear off the form from the pad whilst it is in the binder.